White Paper Abstract: Despite perennial financial constraints, a majority of respondents to HIN's ninth annual Healthcare Trends survey gave 2012 a financial thumbs-up. The Healthcare Intelligence Network conducted the annual survey in the weeks leading up to the presidential election to uncover how healthcare companies fared in 2012 and how they're preparing for 2013. 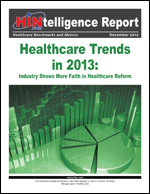 Survey data contains detailed trends provided by 151 healthcare companies who completed the ninth annual survey. This HINtelligence Report provides data highlights on the top business areas affected by economic conditions in 2012, the most impactive care delivery systems, successful programs launched in 2012, business mistakes and lessons learned as well ACA impacts for the coming year. Customized reports, including benchmark results by industry sector, are available upon request.